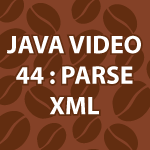 After I made my XML Video Tutorial, you asked me to show you how to parse XML with Java. So, that is what I’m doing in this tutorial. I wasn’t sure how much to cover, because I could literally create a 5 part series on this topic. I decided to cover the basics in the video and provide another example in the code below. If you want to see more, tell me and I’ll cover more on parsing XML with Java. // Returns the first child element in the xml file. Thanks for sharing, whts your next tutorial series ? Next I’ll cover OOP design, design patterns, software development and algorithms. I appreciate the video very much. As a Noob, I spent several hours trying to determine why I was getting a “document not properly formed error”. Turns out that the DTD file is not listed along with the code. I only learned this after a considerable amount of internet research and going to your XML 4 tutorial. Please help Noobs by keeping all the associated code together for each video. But, I also learned more about XML in general during my research on StackOverflow, so its good & bad. Fantastic explanation of parsing xml file in JAVA with examples. the ‘setErrorHandler’ method to fix this. Error: URI=file:///home/niraj/webcode/Lesson44/src/tvshow.xml Line=4: Element type “tvshow” must be declared. Error: URI=file:///home/niraj/webcode/Lesson44/src/tvshow.xml Line=5: Element type “show” must be declared. Error: URI=file:///home/niraj/webcode/Lesson44/src/tvshow.xml Line=6: Element type “name” must be declared. Error: URI=file:///home/niraj/webcode/Lesson44/src/tvshow.xml Line=7: Element type “release” must be declared. Error: URI=file:///home/niraj/webcode/Lesson44/src/tvshow.xml Line=8: Element type “network” must be declared. Error: URI=file:///home/niraj/webcode/Lesson44/src/tvshow.xml Line=9: Element type “description” must be declared. Error: URI=file:///home/niraj/webcode/Lesson44/src/tvshow.xml Line=10: Element type “actors” must be declared. Error: URI=file:///home/niraj/webcode/Lesson44/src/tvshow.xml Line=11: Element type “actor” must be declared. Error: URI=file:///home/niraj/webcode/Lesson44/src/tvshow.xml Line=12: Element type “real_name” must be declared. Error: URI=file:///home/niraj/webcode/Lesson44/src/tvshow.xml Line=13: Element type “character” must be declared. I replaced the document src with a web address, but I always get a 403 error. How can I get past this? Actually, never mind. I found out how. The videos are awesome! You are Awesome !!!….. thanks a ton for all your tutorials….. Thank you very much 🙂 I’ll be getting into the web side of Java soon. May God bless you as well. hi i like your tutorials, they are very helpfull for me! parser. they are common as well.. Thank you 🙂 I’ll do my best to cover sax. I get into parsing options in my Android tutorials as well. Casting error. New to this, so a little unsure on what the particulars are between Elements & Nodes… ugh, going to take some reading. I have a general question tho. What would you recommend to use to update the xml element content . Basically , what is the best way to copy one node content to another node? I cover that as the tutorial continues in depth. Your tutorials are amazing, I am following those since few months, I liked it very very much!Kudos to you for providing such wonderful tutorials that to free! and your efforts for creating those! Lots of blessings to you! Thank you 🙂 I’m very happy that you are enjoying them.